Muscogee Roller Girls Last Bout of 2017! 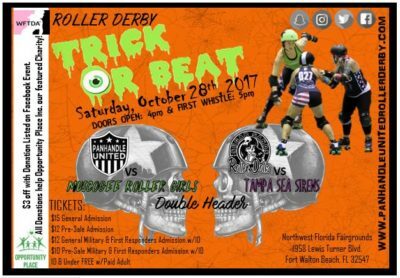 Its time for a beach trip for the MRG All Stars as they make their way to Ft. Walton for their last bout of the season on Saturday October 28th, but there won’t be any fun in the sun for these athletes. They’ll be having fun on the track! Both teams have had big jumps in rankings this season, with MRG as the favorite, this is sure to an action packed bout. This will be Pan U’s first home bout, as they recently reformed, and are hungry for a win. MRG plans to stay strong, MRG STRONG, and finish the season with one more win!